NASA's Mars Atmosphere and Volatile Evolution Mission (MAVEN) spacecraft is in orbit around Mars gathering data on how the Red Planet lost much of its atmosphere and water, transforming from a world that could have supported life billions of years ago into a cold and inhospitable place today. The process that creates the twisted tail could also allow some of Mars' already thin atmosphere to escape to space, according to the research team. "We found that Mars' magnetic tail, or magnetotail, is unique in the solar system," said Gina DiBraccio of NASA's Goddard Space Flight Center in Greenbelt, Maryland. "It's not like the magnetotail found at Venus, a planet with no magnetic field of its own, nor is it like Earth's, which is surrounded by its own internally generated magnetic field. Instead, it is a hybrid between the two." DiBraccio is project scientist for MAVEN and is presenting this research at a press briefing Thursday, Oct. 19 at 12:15pm MDT during the 49th annual meeting of the American Astronomical Society's Division for Planetary Sciences in Provo, Utah. Mars lost its global magnetic field billions of years ago and now just has remnant "fossil" magnetic fields embedded in certain regions of its surface. According to the new work, Mars' magnetotail is formed when magnetic fields carried by the solar wind join with the magnetic fields embedded in the Martian surface in a process called magnetic reconnection. The solar wind is a stream of electrically conducting gas continuously blowing from the Sun's surface into space at about one million miles (1.6 million kilometers) per hour. It carries magnetic fields from the Sun with it. If the solar wind field happens to be oriented in the opposite direction to a field in the Martian surface, the two fields join together in magnetic reconnection. Since Mars has a patchwork of surface magnetic fields, scientists had suspected that the Martian magnetotail would be a complex hybrid between that of a planet with no magnetic field at all and that found behind a planet with a global magnetic field. Extensive MAVEN data on the Martian magnetic field allowed the team to be the first to confirm this. 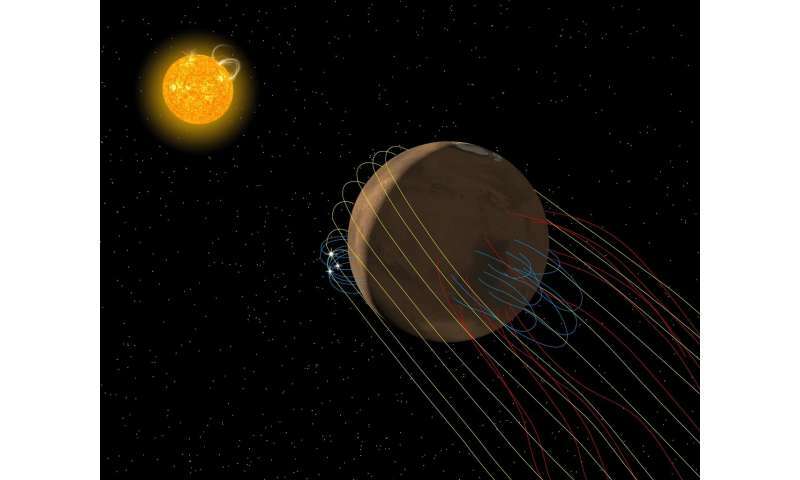 MAVEN's orbit continually changes its orientation with respect to the Sun, allowing measurements to be made covering all of the regions surrounding Mars and building up a map of the magnetotail and its interaction with the solar wind. Magnetic fields are invisible but their direction and strength can be measured by the magnetometer instrument on MAVEN, which the team used to make the observations. They plan to examine data from other instruments on MAVEN to see if escaping particles map to the same regions where they see reconnected magnetic fields to confirm that reconnection is contributing to Martian atmospheric loss and determine how significant it is. They also will gather more magnetometer data over the next few years to see how the various surface magnetic fields affect the tail as Mars rotates. This rotation, coupled with an ever-changing solar wind magnetic field, creates an extremely dynamic Martian magnetotail. "Mars is really complicated but really interesting at the same time," said DiBraccio. Uh-oh. More magnetic reconnection data! @EU folks: See what happens when you have data, models, maths and predictions? It can be verified by real-life data! crazy! Would this magentotail have an impact on the levels of radiation that reach the surface and could affect eventual astronauts or colonists? @Enric - hardly likely, since the worst of the radiation, as far as astronauts/colonists are concerned, is cosmic radiation (very high-speed particles or gamma rays), which would not be affected much, or at all, by the magnetotail. Solar EM radiation (visible light, UV, X-rays) wouldn't be affected at all.